It's almost comedic how the Fear Factory brand has been spread thin across different bands� Arkaea and Divine Heresy�only for half the original members to launch a comeback. So now there's Fear Factory in earnest, plus Dino Cazares' own Divine Heresy, and finally the ill-starred Arkaea (last year's debut sucked.) Despite this dearth of material available for whatever is left of Fear Factory's audience, the present material, on Mechanize stands tall, even far superior to its diluted siblings, much to the delight of anyone who'll ignore the band's past faults and appreciate this latest effort. Appreciate it they will, especially with the hammering title track that opens this release on a deafening note. Aurally witness Burton C. Bell in fine form screaming with righteous fury about evil machines and the dangers of big government. Oddly enough, his harsh vocals are kinda reminiscent of Shadows Fall's Brian Fair. But when he sings however, like on the mournful Designing the Enemy or during Powershifter's chorus, it's a treat. Of course, it's Cazares' cybernetic guitar play that really drives the band, and listening to such groove-laden delights as the title track, Industrial Discipline and the cheesy Christploitation showcases his talent for combining ferocity with whale-sized hooks. Credit is also due the rest of Fear Factory v.2010, namely Strapping Young Lad alumni Byron Stroud and Gene Hoglan, who are filling in for the band's rhythm section. What else can be mentioned about these two? They already shined on last year's supergroup Tenet and shine they once again do throughout Mechanize. Yet for all the praise, there is a worrying fault that haunts the entire album and anyone who has given it more than a perfunctory listen will notice this: Monotony. Not only is Monotony a nice choice for a Fear Factory song title, but monotony is the rule on half the album. For amidst the relentless guitar chugs and face melting percussion, most of the aggressive tracks here seem to melt into a single boring whole. This is a bad sign. While it isn't a sin for seasoned musicians to peddle formulaic songs, it becomes problematic when it undermines the whole album. The only serious reprieve from the worrying sameness is the melancholic down-tempo dirge Designing the Enemy, the hammering interlude Metallic Division, and album closer Final Exit. Come to think of it, this three hit combo is a nice touch that softens the album's ending after a relentless barrage of heavier material. Rather flawed, but still impressive. 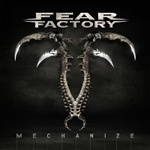 The present material, on Fear Factory's Mechanize stands tall, even far superior to its diluted siblings, much to the delight of anyone who'll ignore the band's past faults and appreciate this latest effort.